If you concerned about what you feed your dog, then check out this free dog food sample. Here’s your opportunity to get a free Rescue Alert sticker for your home or office. This easy-to-fill-out card will alert people that pets are inside your home in the event of an emergency. Please allow six to eight weeks for delivery; limit two stickers per household. Please provide your mailing address. Also, please tell them about the pets in your household who you will be protecting. 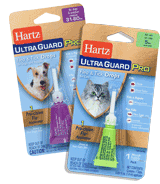 Hartz UltraGuard Pro Flea & Tick Drops for Dogs and Puppies and cats offers vet quality protection and prevention against fleas and ticks.